Tryvix is advertised as an anti-wrinkle cream, making its purpose obvious as soon as you take a look at the label. The goal of the product is to try to prevent the damage that your skin might experience from aging, lifestyle or environmental factors. The cream tries to reverse that process and help your skin cells to regenerate in order to return the wrinkle-free look to your face and give it that glow that it used to have. Tryvix features transdermal appliance, which means that you do not ingest anything, but simply apply the cream into your skin. Who is the Manufacturer of Tryvix? 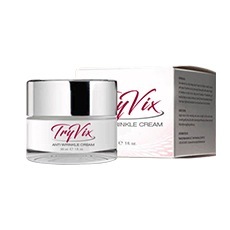 The exact name of the company behind this product is “Tryvix Anti-Wrinkle Cream,” which straightforwardly tells us that the manufacturer only makes this cream and they have no other products in their portfolio. While that may be a good thing as they can focus on a single product, it is also a bit restrictive when it comes to analyzing their reliability and the quality of their work. Just like with other skin care creams, Tryvix needs to be applied transdermally, which means you apply it directly to your facial area. The cream can act to moisturize the skin that is dry and improve the overall level of moisture. It is this moisturizing that may give your skin an improved look and feel overall and it can also play a role in ensuring that there is no cracking. However, the biggest benefit, at least according to the company, is that this product will also assist in ironing out fine lines and wrinkles. They also emphasize that Tryvix may help to counter stress effects that appear in form of debris that cause discoloration and dullness. Tryvix Ingredients – Are They Safe & Effective? What are the Advantages of Tryvix? What are the Disadvantages of Tryvix? How Should You Take Tryvix? The process of applying Tryvix is similar to any other anti-aging cream, which means that you need to start by cleansing your face. After that, take some cream from the jar and gently rub it into your face and neck. You should make sure that your hands are clean. The manufacturer recommends applying this cream before you head to sleep to allow it enough time to penetrate into your skin and do its job while you are sleeping. Tryvix is available via the trial offer of the website of the product, which means that you can test it for a while and only pay a small shipping fee of $6.90. If you are satisfied with the cream, you just continue the auto-shipping program that charges you $131 per bottle every 30 days. What Kind of Reviews are Out There for Tryvix? Some customers were nothing short of delighted because of the effects delivered by Tryvix. They emphasize that they were looking for a way to deal with wrinkles and tried some other skin care products, but this is the one that showed as the most successful option. However, some other users were unsatisfied because they considered that the price of the full bottle was a rip-off as they failed to notice any significant change when it comes to fine lines and dark spots. In the end, we have to be honest and say that Tryvix is just one of plenty of similar anti-wrinkle creams on the market. The product might have a beneficial effect when it comes to dealing with fine lines and it may even be effective to brighten dark spots and improve your skin’s overall look and feel. However, it is hard to discuss potential benefits when we do not have the exact ration of ingredients included in the formula, which makes it difficult to claim anything about the potential effectiveness. Finally, Tryvix may be helpful to combat stress effects and other aging factors, but please keep in mind that the results cannot be guaranteed and may vary from one user to another.